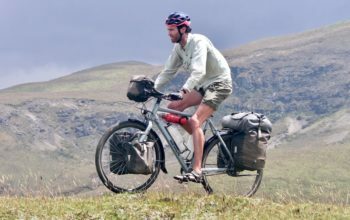 Where to Best Carry A Load When Bicycle Touring: Front or Rear Panniers? 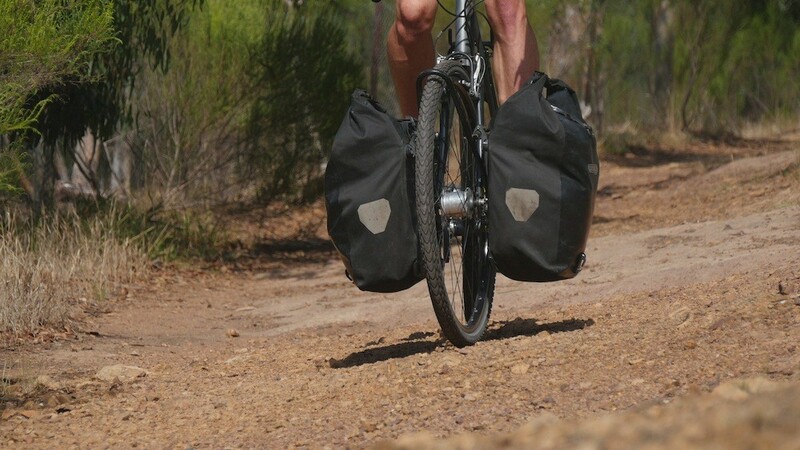 Front loading has recently become a popular way of carrying panniers. 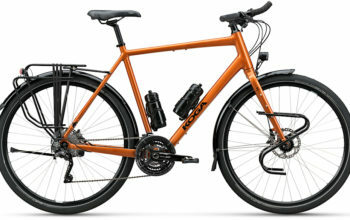 The setup has been made trendy by manufacturers like Specialized with their AWOL x POLER touring bike, or any number of the touring bikes featured on bicycle lifestyle website, The Radavist. But is front loading a better place to locate your gear on a touring bike, or is it just fashion? Riding a rough dirt track with a front load. Jan Heine and the crew from Bicycle Quarterly have been talking about the advantages of front loading for a very long time. 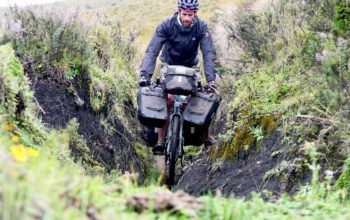 Jan has found that bikes with “low trail” steering (a measurement derived from the headtube angle, fork offset and tyre width) handle front bags exceptionally. Having spent some time on “low trail” bikes with a light/moderate load, I tend to agree that the sharp steering and front weight tend to cancel each other out somewhat. But that said, at a certain point (perhaps with 10kg or so) I’ve also found it simply doesn’t matter what fork trail measurement you have – handling with a front load feels very similar between bikes. I’m going to steer away from the high vs. low trail discussion now, as almost all bikes that people conduct tours on (touring, gravel, hybrid, cyclocross, MTB) offer relatively “high trail” setups. 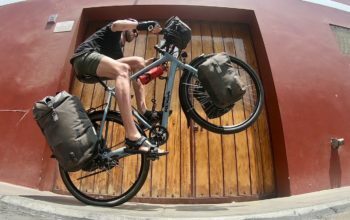 For my testing, I’ve used my Surly LHT touring bike to undertake different tasks, many of them practical – and I’ll try my best to describe how front and rear loading work under each of those circumstances. 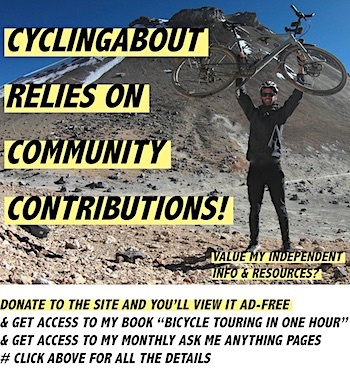 My testing has been conducted on short rides, long rides, city rides, dirt road rides, on climbs and on steep descents. What you’re going to soon notice is that there are many factors at play: front vs rear loading isn’t just about handling. Testing front loading setups at warp speed. Let’s take a look at how front and rear loading will affect your time on open roads. It’s safe to assume that this type of riding is going to be the majority of what bike travellers conduct. Here are my thoughts after thousands of kilometres of testing. When it comes to handling at speed, it’s hard to pick a preferred setup. I got used to both a front and rear load within just a few minutes of riding. What I did notice was that there was a limit to how much weight you can put on the front wheel before it feels unstable – it’s about 10kg. In comparison, you can load up the rear with 20 or 30kg and you’ll find very little change in the handling. Given that the majority of our body weight is over the rear wheel when we ride our bikes, adding additional weight to the back of the bike tends to strain the back wheel more than the front. That is why if you’re using a lightweight bike (or lightweight wheels) it’s best to keep your load to the front. Your rear wheel will thank you for it. Riding with no hands is a great skill to have in your arsenal, as it allows you to stretch out your back and take strain off your neck/wrists at times. More practically, you can use the skill to open wrapped food, or even take photos. Either way, having weight on the front of the bike makes this task much more difficult than if the weight is over the rear wheel. 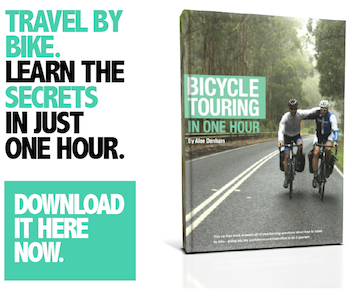 If you’re a cyclist who likes to ride out-of-the-saddle from time to time, you’re going to prefer to front load. As soon as you stand up with a rear load, there’s less stabilisation from the handlebars to the rear of the bike, and in turn, there’s more effort required to stop the bike from moving side to side. Flat handlebars improve the overall stabilisation, but really, front loading is king for out-of-the-saddle riding. There is a certain amount of effort required to turn the handlebars on a bicycle. 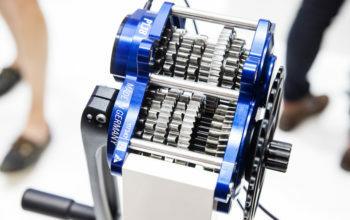 As soon as you add any weight to the front of the bike – steering effort increases. It’s sometimes nice having the feeling of heavy steering – on a long windy descent perhaps. But I’ve found it pretty hard to beat effortless steering in almost all circumstances. 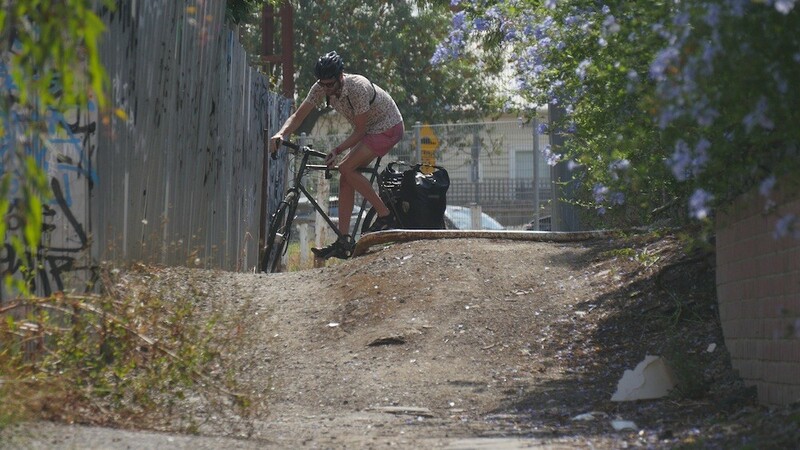 Riding uneven dirt tracks with front panniers only. There is a great need to keep your bike’s front panniers ‘balanced’. If the bags are uneven you will experience speed wobbles from resonance frequencies coming up through the front wheel. I think it goes without saying that with front loading you will need to use both bags, whereas when rear loading, you can quickly adjust to the uneven load of a single pannier. When it comes to steep climbs, front loading really shine – especially on the dirt. Front bag weight keeps the front of the bike firmly on the road at all times. I like to make small adjustments to my front wheel as I ride, in order to quickly avoid debris, puddles and bumps in the road. Most often it’s a last-second adjustment because I’m generally fixated on the world around me, rather than the pavement a few metres ahead. With the weight up the back, my bike turns super fast and I can avoid almost anything with only a fraction’s notice. Rougher surfaces tend to ride better with weight over the front wheel, especially on steep descents. This is because there is more weight over the front wheel, resulting in more front end grip. This grip will also offer you more confidence, allowing you to carry slightly faster speeds. 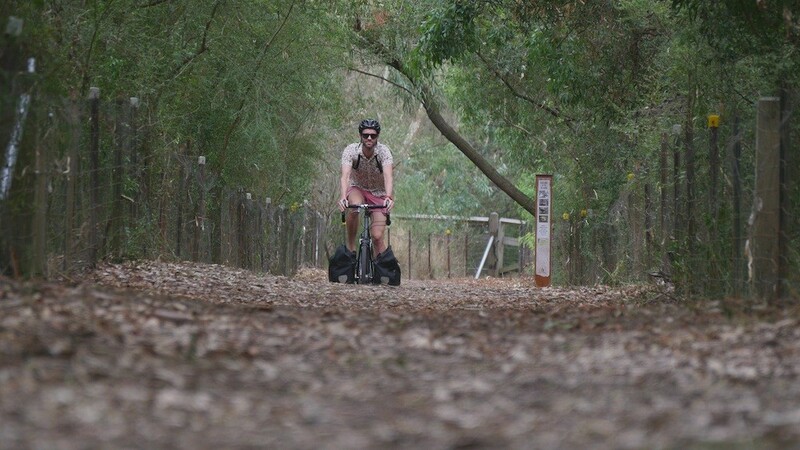 As dirt roads are sometimes quite rough, it also makes sense to distribute your load more evenly across your bike (panniers up front, body weight up back) so that your front wheel takes its fair share of abuse! Although front racks can be found with a top tray to offer storage above the panniers, a rear rack can comfortably take two large panniers, plus a racktop bag and whatever else you want to strap onto it. You’ll easily get 80L of storage on the back if need be. This one is rather obvious but worth discussing anyway. If you are not using a touring-specific bike and you have large feet, you could have problems with your heels striking your rear panniers. This is one of the very reasons why a touring bike has long chainstays (435mm minimum). 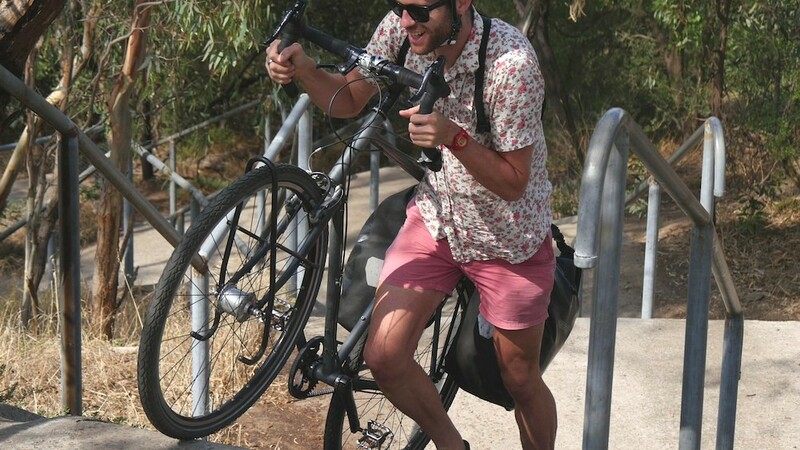 With front panniers you can opt to use any bike you like with very short chainstays. Testing front panniers on the rockiest trail I could find. My urban testing was completed in the inner city areas of Melbourne. I rode along footpaths, roads, alleyways and bike tracks. I split traffic, completed many slow speed maneuvers and stopped/started a lot. Here’s what I’ve found. In urban areas, ground clearance is paramount. I often find myself wedged between the traffic and high gutters when I’m moving through built up areas. Front panniers reduce your clearance as they sit lower to the ground – I’ve found it’s much easier to squeeze between cars with the higher-sitting rear bags. At slow speeds, you use your steering to balance from left to right. With your weight up the back, your steering is light – making it easier to balance your bike. Riding along a busy footpath is the perfect example of a time when slow riding is necessary. Given that the steering is faster and lighter with a rear load, it makes sense that a u-turn is best performed with this setup. Without front panniers affecting your line of sight, you can place your front wheel exactly where you’d like it to be too! Performing a tight u-turn with a rear load. I’ve found that parking my bike with rear panniers is easy – it’s as simple as leaning my rear panniers up against a solid object. There’s no lifting or adjusting, and once leaned, the handlebars and front wheel are less inclined to want to swing about. If you’re a rear kickstand user, you’ll find that front loading tips your bike over because there’s a lack of weight over your rear wheel. Conversely, centre-mount kickstands like the Pletcher ESGE prefer having weight over the front, provided it’s balanced. I seem to come into contact with stairs all the time on my bike tours! Most train stations, hotels and built-up areas use stairs to move people up and down levels. I’ve found the most effective way to get a touring bike up stairs is to drag it. With the weight on the rear, you can lift the front wheel slightly, and push the rest along. Front panniers on the other hand will hamper your efforts – you may even need to take them off entirely. Pushing my touring bike up stairs with a rear panniers. So What’s Best: Front or Rear Loading? Although front loading excelled through some testing areas, I’ve found it more practical to use a rear rack and panniers (and a small handlebar bag) for a few reasons. On the open roads it’s nice to be able to see where your front tyre is travelling and make quick adjustments to the direction of the bike. I like not having to balance my bags every time I go shopping, and being able to strap whatever I want to the top of my rear rack (heavy or not). I like travelling with a single pannier, and riding effortlessly without my hands on the bars to stretch out my back. 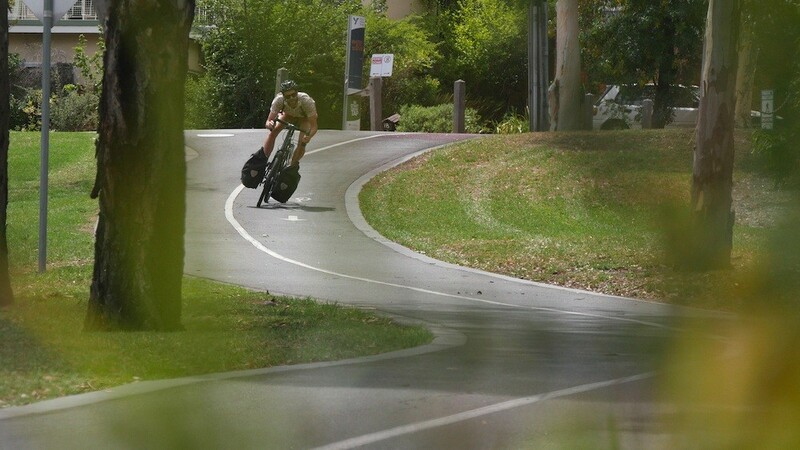 Throughout my urban testing, rear panniers made my life easier across all tests – in particular for anything that required slow speed maneuverability, such as weaving through pedestrians or completing u-turns. As there’s more ground clearance, it’s certainly better to split traffic with a set of rear panniers too. When Should You Front Load? There are a couple of instances where I preference front panniers over rear. Front loading can be great. I really do like the setup on big, open, dirt roads – luckily my touring bike has the option of both setups. But while there’s currently a bit of a cult following around front loading, I will continue to use and recommend rear panniers on all but dirt road -specific tours. Happy riding! 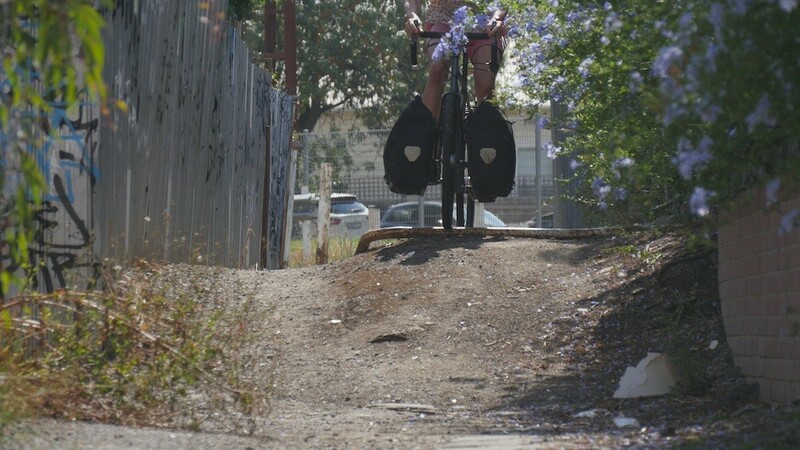 Jumping off a small lip with front panniers. What’s Your Experience Been for Front and Rear Loading?